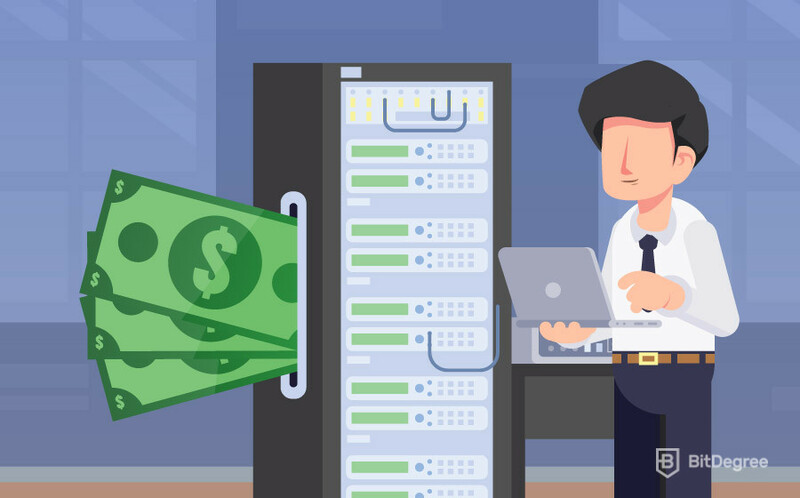 SQL Developer Salary: How Much Can SQL Developer Make? App development has become a very popular line of work over the past couple of years. Everyone from individual creators all the way up to giant corporations seem to be concerned with apps. And although there are many different ways to go about it, one of the more popular professions that rose out of this trend is the SQL developer. This job position usually offers great working conditions, flexible timetables, awesome team members and… a great SQL developer salary. Is it true that SQL developers get paid a lot? Or is it all an overblown hoax? That is exactly what we’ll be talking about in this article. First of all, the career path itself. We’ll shortly cover SQL development as a whole – why it’s good, what it’s used for, what are the requirements, and so on. After that’s done, I’ll tell you about some of the main types of SQL developers that there are. You probably already know all of the associated job tags that go along with these things, but it’s worth mentioning how they apply to this line of work. 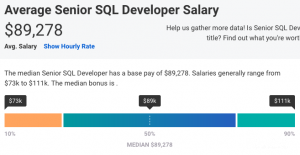 Finally, in the end, we’ll talk about the actual SQL developer salary. Before we get into the numbers, we should build at least some fundamental knowledge of what a SQL developer is and what do these people do for a living. 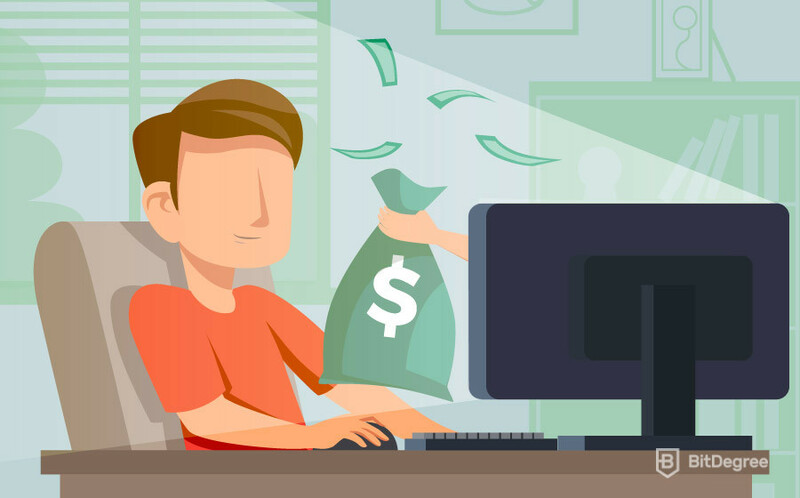 This information is important, since, after you see the SQL developer salary, you will be able to develop a better understanding of what a person has to do in order to make that amount of money. Another key aspect of why it’s important to know the intricacies of the SQL developer’s job is to understand how much work, learning and overall effort goes into becoming one. It can be really easy to look at a specific number and think – pfft. They get paid that much? What for?! Without understanding all of the different aspects that go into working as an SQL developer, it can be really tough and confusing to talk about the SQL programmer salary. So, what does an SQL developer do? Well, to put it very simply and without going into too much detail, SQL developers are people whom tasks are mostly based around developing and programming applications. These developers write apps, manage SQL databases and work with code (test it, adjust it, etc). If you were to apply for an SQL developer’s job position, you’d have to have some sort of relevant formal education (preferably – a degree in computer information systems), be capable of logical thinking and quick problem solving, and being able to design various different applications. There are certain exceptions (i.e. you can get hired without formal education), but they are just that – exceptions. Now, with that covered, you should have at least some sort of an understanding of the SQL developer’s job position, in general. Let’s move on to the different types of these developers. You probably already knew this, but each job that you’re going to try and apply to will have different titles to accompany it. For example, if you were to go and work as a copywriter, depending on your experience in the field, you’d receive a certain “tag” to go along with the job. Some jobs use specific, exclusive tags, but there are three that are widely accepted and used with most job titles out there. These three are entry-level (beginner), junior and senior. If you’ve never written an article in your life, but still managed to get that job because of your charisma and motivation to learn, you’d probably be classified as an entry-level copywriter. If you love writing and do it all the time, but have no prior experience with working in a company, then you’d probably get the junior title. Finally, if you’re an already-proven copywriter that has a lot of personal projects, years of experience and a great reputation under his or her belt, you might just be appointed as a senior copywriter. Can you catch my drift? All of these titles carry different responsibilities, workloads and, naturally, different salaries. The same can be said about the SQL developer salary – depending on the person’s work experience and skill level, the salary will fluctuate, as well. With that said, let’s move on and cover each of the three groups individually. With that, you’ll have a better understanding of what are the requirements to qualify into each of the groups. Entry-level (or beginner) SQL developers are the youngest and least-experienced group of the three. I say youngest simply because this group is mostly made out of recent university graduates (or people who are still in their second or third year of uni) who are ready to take on a real challenge in a real workplace. Truth be told, however – there are a lot of people who would qualify into this group who have no formal education, whatsoever. These people are in luck – as time goes on, more and more employers turn their backs to the “formal education” requirement, and are satisfied with a person that has finished a few online courses or read some books. Potential employers today look at a person’s character – with time and patience, skills can be taught. The same cannot be said about character traits. The entry-level SQL developer salary is usually quite a bit lower than that of a junior or a senior developer. Naturally, the main reason for this is the difference in skill level, but there are also other variables involved. Some wannabe SQL devs only go to work in a company because they need to pass some sort of a subject in school (university). These students are usually anything but motivated – and that goes to show. Other than that, the biggest thing that a beginner SQL developer has to do is learn. Most of this person’s tasks are going to be centered around learning and getting to know all of the tropes of the industry. The junior group of SQL developers is somewhat the same as most junior groups out there – it’s huge and complex. The complexity part comes in only when we’re talking about the junior SQL developer salary, so perhaps we should get it out of the way first. The junior group is in the middle between the beginners and the senior SQL developers. This means that there’s bound to be some overlap (as experience would show – a lot). Why is that? Well, simply because there are no clearly-defined boundaries or rules when does a beginner become a junior or when a junior becomes a senior SQL developer. Since this is the case, the junior group of developers could one day consist of more entry-level people, and have a lot of experienced developers the next. When it comes to the actual workload, a junior SQL developer works on most of the standard, every-day tasks that the company has to deal with. These developers are usually way past their initial training phase, although they still have a lot to learn in order to advance to the next group. The junior SQL developer salary is also complicated. In most cases, it’s a point of negotiation between the employer and the employee. Since some junior developers have more experience than others, it’s only natural that their salaries would be different, too. With the two groups covered, let’s move on the final group of developers – the senior ones. After that, we’ll be able to jump straight into the SQL programmer salary analysis. Senior SQL developers are the biggest professionals of the craft. These people have dedicated their entire lives to learning, perfecting and studying SQL. Even though it might sound like a stretch, senior devs are truly essential members to any team or company that work with app development. Senior SQL developers have the most difficult and time-consuming tasks in the company. Since they know SQL like no one else, they’re often the only competent people to work on these assignments. Furthermore, it’s very rarely the case that a senior developer would only be working on a single task. A big portion of these developers are often assigned to mentor company newcomers. The same applies to any job position, though – if you’re a senior member of the team, you will probably have to act as a mentor, no matter your job title. When it comes to the senior SQL programmer salary, it is often seen as the peak of the mountain – the dream salary that should be strived for by every single SQL developer who takes his or her work seriously. Whether that’s true or overhyped, don’t worry – you’ll find out soon enough. With that said, we have now covered all three of the main SQL developer groups. At this point, you should now have a better understanding of both the actual job position itself, and the different types of SQL devs that there are. Sure, you might encounter companies and employers that have their own methods of categorizing this profession, but these methods are the main ones that are used across the whole spectrum of the job market. So – we’ve finally reached the point in the article where we’re going to discuss the actual SQL developer salary. I do, however, strongly believe that the context was truly needed for you to better understand what goes into being and working as a SQL developer. A couple of final points before we start talking numbers. First of all, the SQL developer salary presented in this tutorial is just an estimation – please keep in mind that the salaries offered by your local “SQL developer hiring place” might be quite different. The numbers are representations of salaries in the US, so there might be deviations based on your geographical location, skill level, job description, etc. Also, I will be using the average US salary as a point of reference (as of writing this article, it’s around the area of $3700 USD). 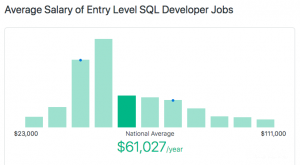 As I’ve mentioned earlier in the article, the entry-level SQL developer salary is considered to be on the lower side of the spectrum. But just how low are we talking about? Ziprecruiter.com states that the estimated entry-level SQL developer salary should be somewhere around $61,000 USD per year, or around $5080 USD per month. All things considered, that’s actually a great salary! Seeing that we’re talking about a group of SQL developers who have only recently started their journey down this career path, it’s definitely on the better side of things. Again, the junior SQL developer salary is a difficult topic to discuss, since it’s very volatile and prone to fluctuation. Remember when I said that you should keep in mind that the SQL developer salary is constantly changing and is very dependant on various factors? Well, this applies to the junior group more than anywhere else. That being said, Glassdoor.com still provides a solid, specific number. 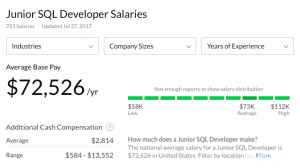 According to the site, the junior SQL developer salary should be around $72,500 USD annually, or $6,400 USD per month. Given the entry-level SQL developer salary, this does actually make sense! However, it’s still pretty far from the senior SQL programmer salary. Senior SQL devs get paid the biggest amount of money in that this specialty has to offer. But just what number are we talking about here? Payscale.com estimates that the senior SQL developer salary is around $89,300 USD per year, or $7440 USD per month. Even though this number might be smaller than that of, let’s say, a computer engineer salary, it’s still a great salary to be working towards! So, we have reached the end of our SQL developer salary article. I hope that you found the information that you were looking for, and that you’ve learned something new. If you’re thinking about studying and becoming a SQL developer yourself – go for it! It’s definitely one of the tougher specialties out there, but, as you can probably see for yourself, hard work is always rewarded in the end! Best of luck in your future career path!